The Go Fast Firewood Wrapper is the only industrial duty firewood wrapper available on the market today. 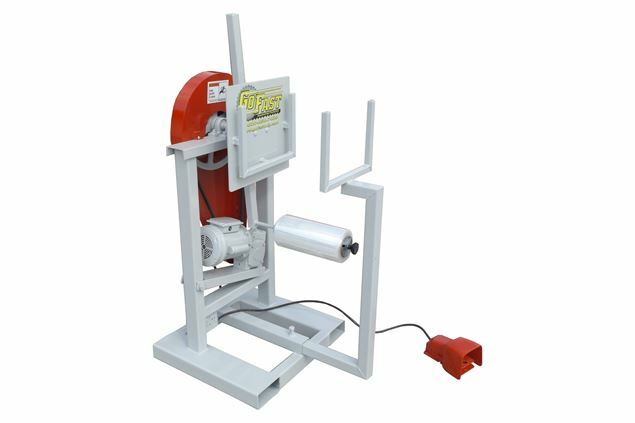 This machine can wrap a bundle in under 12 seconds, making it the perfect solution for banding firewood bundles. The wrap is tensioned by a standard nut that ensures tight bundles and maximum wrap usage. Our firewood wrappers are simply better by design and unlike other manufacturers, we use high speed farm duty motors along with lubed bathed gear boxes. This allows us to get a higher amount of torque from our energy efficient 1/3HP motor. These components have proven themselves to outlast the light-duty, low speed motors that are commonly found on other firewood wrappers.